Route 66 is definitely one of the most iconic and important highways in US history. It served as a major path for those who migrated west when California was seen as the promised land during the Great Depression. The golden era may long gone but the romance of Route 66 continues to captivate people around the world. It’s an unforgettable trip back in time to bygone America, an era of neon sign motels and mom-and-pop diners. Realistically, you need at least two weeks to complete the whole journey from Chicago all the way to California; we managed to complete the course in ten days with a hire car but by really pushing our luck with lots of driving each day. If you’re on a gunshot road trip like us, here are a few highlights along this legendary historic road that you don’t want to miss. Chicago is the starting point of Route 66 but don’t rush as there’s lots to see and do in this ‘windy city’. Chicago is renowned for its stunning art, sculpture and architecture. Take a stroll in Millennium Park and take a selfie with the Cloud Gate, a sculpture that looks like a giant drop of liquid mercury and reflects the whole city from different perspectives. Across the street from the park is The Art Institute of Chicago, which has an extensive art collection on display over four levels in two buildings, including the ‘America Gothic’. Then kick start your road trip with a skillet breakfast at Lou Mitchell’s, this iconic greasy spoon diner has been serving hungry Route 66 travellers since 1923, it is an important institution of Chicago. Within walking distance, you will find the road sign on Adam Street that marks the official starting point of the Mother Road. Make a quick stop at the second most populated city outside of Chicago metropolitan area – Springfield, the home of the most famous past resident of United States – Abraham Lincoln. Cross the state to Missouri, where a pit stop at Ted Drewes Frozen Custard in St Louis is a must. This family business has been running since 1929 selling their signature frozen custard – an ice cream that’s a lot smoother and creamier than your average scoop. Try Reese’s Concrete, but be prepared for serious brain freeze. You can’t come to St Louis and not visit the almighty Gateway Arch. It soars 630 feet (192 metres) into the sky and the arch is visible 30 miles (48 km) away in every direction. Visitors are able to go all the way up to the highest point of the arch for an impressive view of downtown St Louis. There are plenty of quirky and unusual places along Route 66. 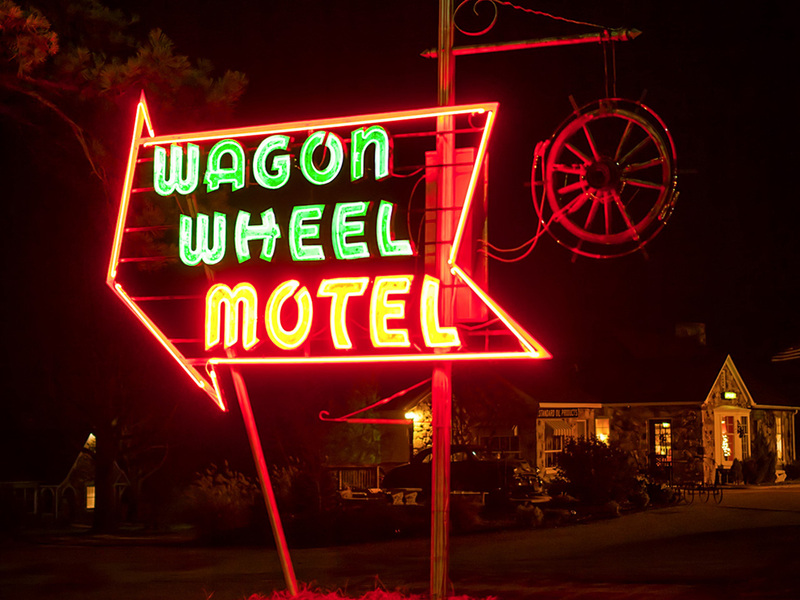 We ended up spending a night at the Wagon Wheel Motel in a small town named Cuba so that we could experience the *ahem! * coin operated ‘Magic Fingers’ vibrating bed, just like the ones you’ve seen in movies. Sadly they are almost obsolete and this is the only one left on Route 66. Drop a quarter in the coin box and let the bed hum you to sleep like – it’s a bit like snuggling up to a giant purring cat. While you’re in the area, it’s worth driving 4 miles (6.5km) out of Cuba to Fanning, where you’ll find the world largest rocking chair at 12.83 metres tall. A small part of Route 66 runs through Galena in Kansas. Here you really get a sense of what it would be like driving on the original Mother Road during the golden era as many of the original buildings are well preserved. Children will love this part of the town because they get to meet the boom truck that inspired the Pixar’s animation film ‘Cars’. Don’t leave Kansas without stopping by at Steve’s Candy store to grab some Mine Run Candy (honeycomb) and beef jerky for the long drive ahead. If you like anything kitsch, then the iconic Blue Whale in Catoosa guarantees a random selfie or two. If not, keep driving to Arcadia and try some soda (soft drinks as we call it) at POPS restaurant, seving a total of 600 varieties from all around the world! It almost seems wrong not to try the Route Beer 66 while you’re here. Oklahoma city is only another 30 minutes drive from here. It’s nice to be back in civilisation after days of driving on long country roads. The city also marks the half way point of the journey. Best to spend a few extra nights here in Oklahoma to explore this beautiful city. One of the highlights is the Oklahoma City National Memorial and Museum. This memorial park is the ground zero of the 1995 bombing disaster. Two monuments at each end of the park mark the frightening two minutes of the bombing, nearby are 168 chairs that glow peacefully after dark representing the number of lives lost. Formerly a warehouse district, Bricktown is now an entertainment hub on the east side of the city, packed with restaurants, pubs and nightclubs. Feeling thirsty? Head to Bricktown Brewery, a micro-brewery restaurant where you can taste their craft beer brewed on the site and also enjoy hearty American fare, from Fat Elvis Chips to Cornflakes Crumbed Catfish. Be mindful that the portion sizes are huge, you definitely won’t go home hungry. The Route 66 Museum in Clinton is worth a visit – you’ll learn more about the history of the Mother Road. And for food lovers, make sure to hit Del Rancho restaurant not far from the museum, for the most incredible chicken fried chicken sandwich. The southern-styled fried chicken is juicy and tender with an earth-shattering crunch to every bite. Pass the border and now you’re in the Lone Star state – Texas. Conoco ‘Tower Station’ is another iconic building that inspired the Pixar’s Cars and can be found in a small town named Shamrock. Keep an eye out for the Cadillac Ranch, it’s visible from the highway as you’re driving towards Amarillo. This life size art installation consists of 10 old Cadillac automobiles, half-buried nose-dived in the ground, at an angle corresponding to that of the Great Pyramid of Giza in Egypt. The art installation is constantly evolving as visitors are encouraged to spray paint graffiti on the cars. 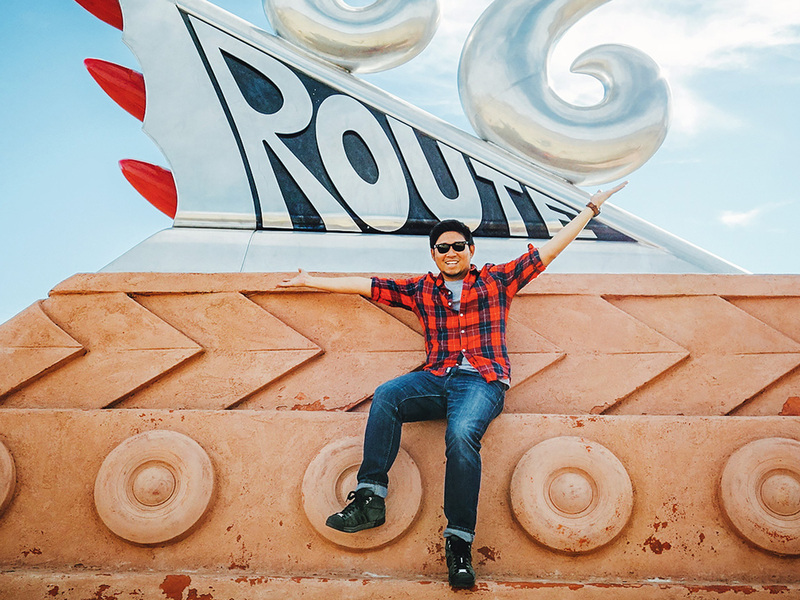 A selfie at the Route 66 Monument in Tucumcari is a must. This beautiful sculpture of a stylised Cadillac-like tail fin motif evokes the 50’s and early 60’s, the golden age of American Cars. Tucumcari is a quaint little town where the legendary road is still lit at night by the glowing neon signs at the mom-and-pop motels and restaurants. The iconic Blue Swallow Motel is worth an overnight stay, where you can share travelling stories with fellow road trippers. 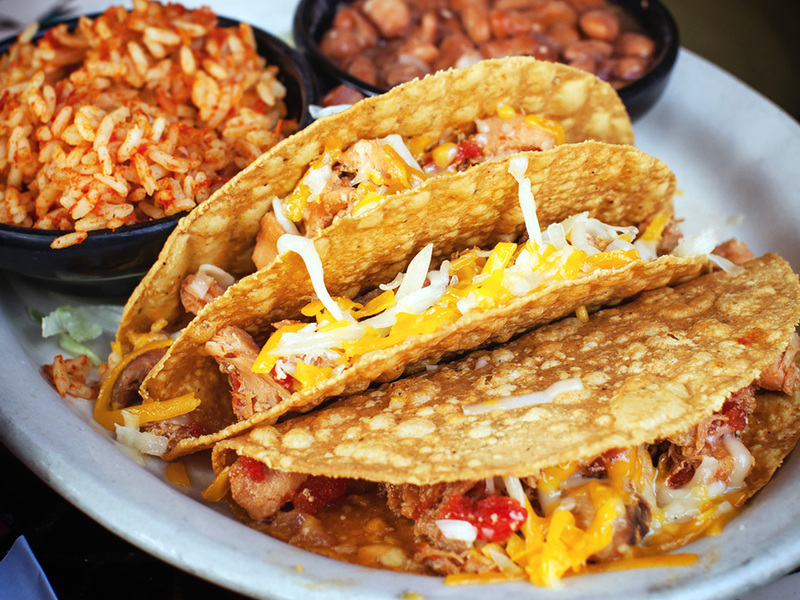 When in Albuquerque, eat all the spicy Spanish/Mexican food you can get – a good place to start is the Old Town Plaza. This part of town looks much like it did when it was built centuries ago. Get lost in its earthy tone Pueblo-Spanish style architecture with flat-roofed buildings and soft contours of adobe mirror the Southwestern landscape. You know you’re in the right spot when you see dried chilli peppers hanging outside the houses. 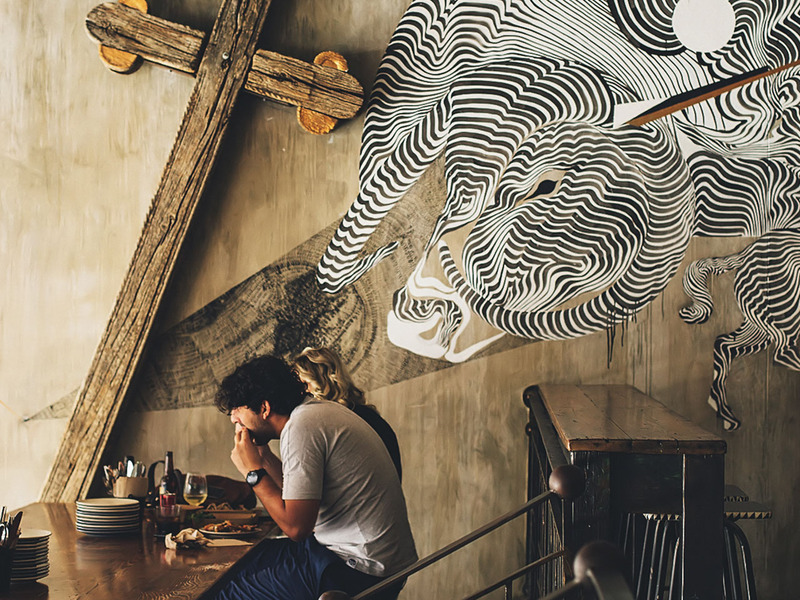 Church St Cafe serves up comforting home cooked Mexican, with tamale, tacos, sopapillas and agave margaritas. After the meal, take a step back in time to the Rock n’ Roll era at Route 66 Malt Shop and relax with a thick peanut butter malt shake while grooving to the sweet tunes from the jukebox; a perfect hangout for Marty McFly. You’re on the home stretch now! If you’re travelling as a couple and still haven’t killed each other, congratulations. The last part of the journey in Arizona is also the most scenic route of the whole trip with many old Route 66 markers remaining. It’s the longest stretch of Route 66, winding through painted deserts, volcanoes, pine forests and ghost towns. Spend a night in a conical teepee-shape motel room at the Wigwam Motel in Holbrook. These distinctive historic landmarks are scarce as there are only two surviving wigwam motels on Route 66. Even Oprah slept here once. An hour drive heading west is the impressive site where a meteor about half the size of a football field crashed landed 50,000 years ago, leaving a massive crater about 1.6km wide. After driving nearly 2,400 miles (3942 kilometres) on the most legendary road of the continent, this bigger than Ben Hur road trip finally comes to an end! The last stretch of the road trip is possibly the least exciting and also the most stressful. 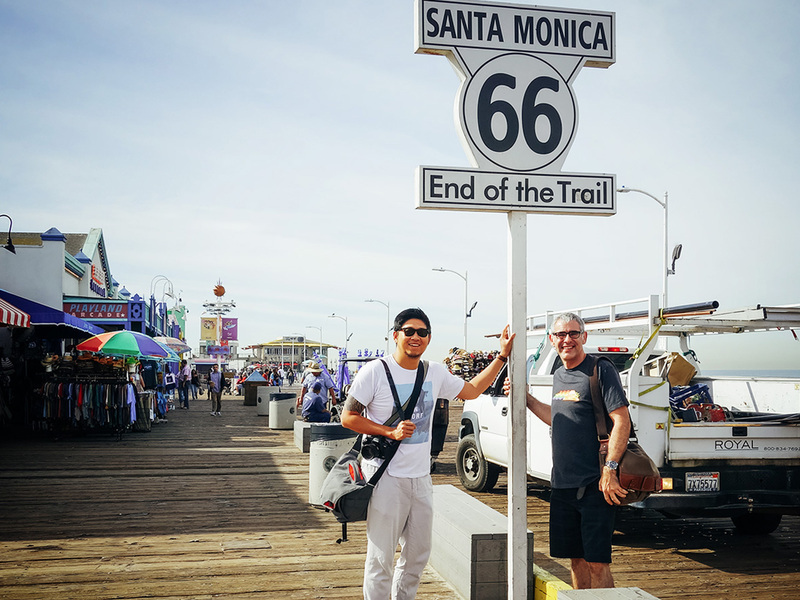 However, before reaching Santa Monica Pier where the historic route comes to an end, one must overcome a few obstacles including the horrendous Los Angeles traffic. This is an unforgettable journey into America, then and now. Route 66 is truly the Mother Road of America.